We are absolutely hooked on coconut rice! And, while this kidney beans and rice recipe is so much more than just two ingredients, we must admit that the coconut rice has a BIG effect on the dish as a whole. Find out how to make coconut rice in your rice cooker here. Kidney beans aren’t just texture! They happen to be packed with some of the stuff your body needs to operate at its peak. Loaded with complex carbohydrates, vitamins and minerals, kidney beans are a wonderful element to add to a well balanced diet. They also just happen to be low in fat. YAY! IS THIS THE SAME AS JAMAICAN RICE AND PEAS? While this kidney bean recipe bears some similar hallmarks to a traditional rice and peas – it differs in a number of key ways as well. We intentionally left the scotch bonnet peppers out to mitigate the heat – and we’ve omitted the typical thyme and scallions to keep the ingredients list in check. So, no – this isn’t a traditional Jamaican rice and peas recipe. 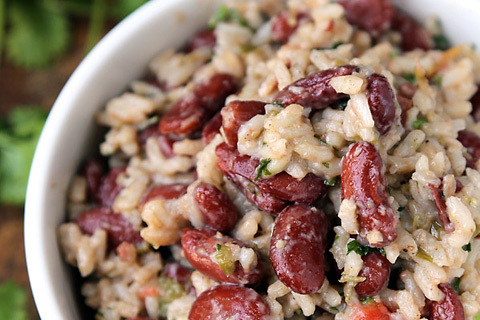 However, we think the nutty, savory and sweet mixture of coconut rice – and allspice and cumin loaded kidney beans – definitely channels the flavors and spirit of the Caribbean islands. We hope it’ll be a crowd pleaser in your home, as it is in ours! Beans and rice are just a magical combination! Any time two humble ingredients can be combined to create something greater than the sum of its parts, we’re all in! Oh, we’ll say it… we LIVE for those rare perfect food pairings. Rice and beans are staple foods that manage not only to be healthy, but to also bring an outsized heartiness to any meal. And, adding a few spices and ingredients can transform those modest, yet perfect ingredients into a full on main course of delicious proportions. Let’s cook coconut rice and beans! In a large deep skillet over high heat, add extra olive oil, garlic and onion, and cook for 5 minutes. Add tomatoes, bell peppers, cumin, all spice and cook for 5 minutes. Place coconut rice, add kidney beans and cook for 5 minutes. Turn the heat off, season with salt and pepper and serve.